The easy way to hand polish! Hand polishing is the definition of hard work. The Pinnacle Polishin' Pal changes this definition by reducing the effort needed to hand polish while improving the results. 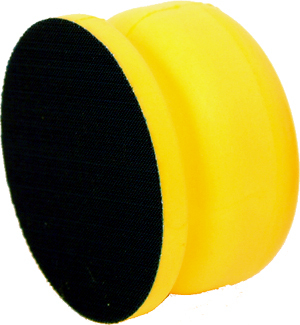 The Pinnacle Polishin' Pal is a urethane handle designed to mount 4-inch polishing pads. This comfortable mount gives you a large amount of leverage, enabling you to polish faster and significantly reduce fatigue. Polishing paint by hand is terribly inefficient. Holding a thin microfiber towel under your fingers and rubbing back and forth will create uneven spots and leave your digits begging for a break. The Pinnacle Polishin' Pal allows you to mount the same high-quality foam polishing pads used by machine polishers as well as apply consistent pressure for high-quality results. The Pinnacle Polishin' Pal is constructed of durable urethane that has been ergonomically shaped to fit comfortably in the palm of your hand. It features a finger grove around the circumference for easy holding. A hook and loop material covers the entire underside diameter of the Polishin' Pal for secure mounting of any hook and loop 4-inch polishing pad. You can change the type of pad, just like when machine polishing, for a variety of tasks from aggressive compounding to wax application. Whether you are removing paint defects such as scratches and swirl marks or applying a uniform layer of your favorite wax, the Polishin' Pal from Pinnacle is your friend!